Goth down! Goth down! In just minutes, David Hasslegoth and the Gothwatch rescuers will run onto the scene carrying revitalising bottles of Snakebite and some Gothasols. Let's hope they can survive the Daystar until then. 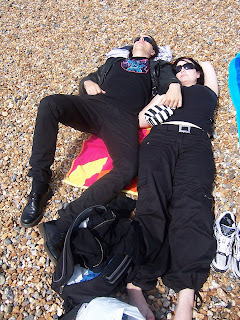 They do, however, know the correct way to sunbathe a la Goth - as covered up as you can be, with a bag full of poetry and pseudo-intellectual books, presumably L’Étranger or À la Recherche du Temps Perdu. Minus points, however, for the white trainers. Poor show Gothette! Side note: As a Didi-Goth I once took to a beach with some 'intellectual' reading in order to pull the clever totty (my favourite kind). I made two mistakes; firstly,the beach I was on was in Malia, Crete where the words 'clever' and 'totty' don't often mix; second, the book I chose was 120 Days of Sodom by the Marquis de Sade. Consequently I spent a week lying on a beach shouting "Oh God NO! He's doing what with a WHAT? And why are THEY standing over him?" To this day I am the only man ever to go to Malia and not pull. To be fair though, the trainers do not belong to her. They belong to the Goth with a camera....why oh why there are no proper running shoes in black?!?!?! Beach full of rocks! Ouchie! Need those fold-out chairs. You can buy black running shoes (and other sturdy, utilitarian footwear) at shoesforcrews.com. Price is moderate, quality is good. I had a similar experience with "120 days of Sodom." I bought it at the airport, thinking it would be cool to read on the plane. A seven hour flight. Big mistake. "Oh, god, no," "eeeeewwwwwww!," and "Why didn't I buy Jane Austen?" By the way, I used to be a goth. It was serious fun. Marquis de Sade = trust me, you don't want to know. Let's just say they were right to lock him up. Please excuse this stupid American... What does "to pull the clever totty" mean? Hmm, nice, 120 Days...yeah...traumatizing right there...your warning should have been in the first glance of the book. Hope you didn't have to many nightmares.